Premonitions and warnings about the future have always been a part of Blue Sargent’s life in her small home shared by several psychic women. It’s why she stays away from boys: the first boy she kisses will die, according to the predictions of the clairvoyant group. Staying away from them has never been difficult for Blue. Especially staying away from the over-privileged boys of the Aglionby school. That is, until an unexpected vision on St. Mark’s Eve and a forgotten journal pull Blue into a dangerous and mesmerizing quest led by one of Aglionby’s finest students. Though she is at first repelled by Gansey’s flippant attitude about money, something deeper flashes beneath the carelessness and bravado, and Blue can’t help but be captivated by that Gansey. If only she can find a way to keep him from dying. Filled with memorable characters and fresh wit, The Raven Boys is a wild ride from start to finish. Readers familiar with Stiefvater’s Shiver will find this a much more highly developed work. When I read Shiver, the repetitive use of the phrase, “for a long moment,” bothered me. I hadn’t read anything by Maggie Stiefvater between reading Shiver and The Raven Boys, so I was sort of braced for those words to appear everywhere. (Which now seems pretty ridiculous, when I think about it.) Despite this, it’s difficult to imagine readers beginning this series and not eagerly anticipating the second book, Dream Thieves, which came out in September 2013. I’ve read this novel more than once, which in itself is a testament to how great the writing is. I don’t get to reread books much anymore, because my list of new books to read is always so long! I always feel torn about falling in love with this series because of the prominent presence of the psychic characters. Usually it’s a subject that I’d probably avoid in literature, largely due to disinterest, but also for spiritual reasons. Despite that, I can’t help really getting lost in the beautiful Virginia landscape Stiefvater creates. I love the way the boys relate to each other. Their deep friendship and the complicated history that simultaneously drives them apart and binds them together is absolutely captivating. The fact that Blue has this huge, ominous prediction hanging over her head really kept the tension high throughout the whole story. It’s not the only instance of foreshadowing, either. I love that each character has not only a complex history that creates powerful drive but also some kind of dangerous ability or prediction that haunts their steps. It’s the kind of stuff that keeps you turning pages long after bed time. Blue’s mother and her friends use psychic ability to make their living and to predict what will happen in Blue’s life and the lives of her friends. Much of the story centers around belief in these abilities and in magic, spirits and rituals. Blue and her friends befriend a ghost and help him maintain a presence. Blue is gifted with the ability to strengthen psychic energy. Two brothers engage in a brief fist-fight. One boy suffers physical abuse at the hands of his father, and another boy defends him. The scene is brief. A man is trampled to death, but no details are given of the event. A woman plans to murder a man as part of a ritual. Characters fight over possession of a gun in two different scenes. One of the boys has a tendency to drink alcohol and get into trouble. It’s not featured much (one night he gets drunk because he’s having trouble sleeping), but not condemned as a behavior, either. 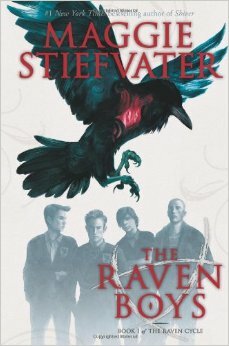 Tagged 2013 YALSA Top Ten Nominee, Maggie Stiefvater, Scholastic Paperbacks, The Raven Boys. Bookmark the permalink.